Reminisce about your past globetrotting adventures with this stunning, oversized three-panel world travel map. Our own exclusive design, this modern Earth Toned World Map is not only an attractive art piece for your wall, it is also a fun and creative way to track past travels and plan future trips. The neutral, warm colors and dark grey background of this frameless world pin map, combined with the rich canvas texture and contemporary 3-panel gallery wrap design, make it the perfect choice to spruce up the décor in your home, office or business. The extra-large size of this 3-panel canvas map provides you more space to pin and larger font sizes. Add your name and favorite quote to truly make the map your own. 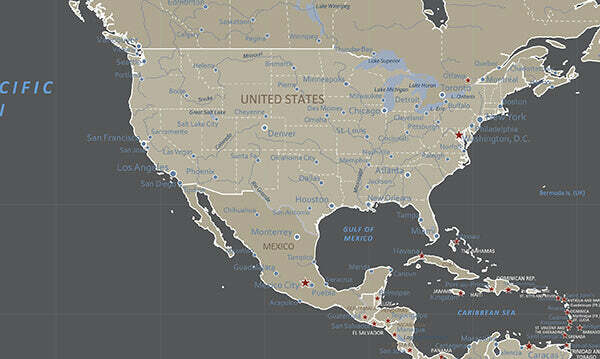 Your custom personalization will be printed directly on the map itself, creating the ultimate conversation piece. Makes a thoughtful gift idea for any traveler in your life! 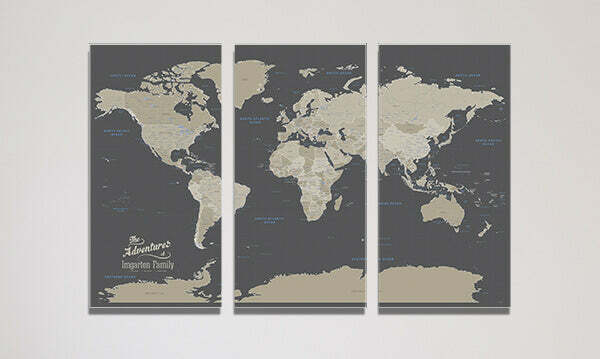 Or if you'd prefer a more classic styling, check out our framed canvas Earth Toned World Travel Map.